Take the first step in faith. You don't have to see the whole staircase, just take the first step. – Martin Luther King, Jr.
What is the first step to start financial planning? If you are planning a journey, the first step is to know ‘from where are you starting your journey’. Similarly to start financial planning the first step is to understand where you are financially. Then we can plan your journey from there to reach the financial destination you want. The answers to the following four questions will reveal you where you are financially. What are all the assets you own? List down with their approximate market value. An asset should put more money into your pocket. So don’t include assets like self occupied property or your car as an asset. Include fixed assets; financial assets… Check your bank statement, investment statements to get the complete list of assets you own. 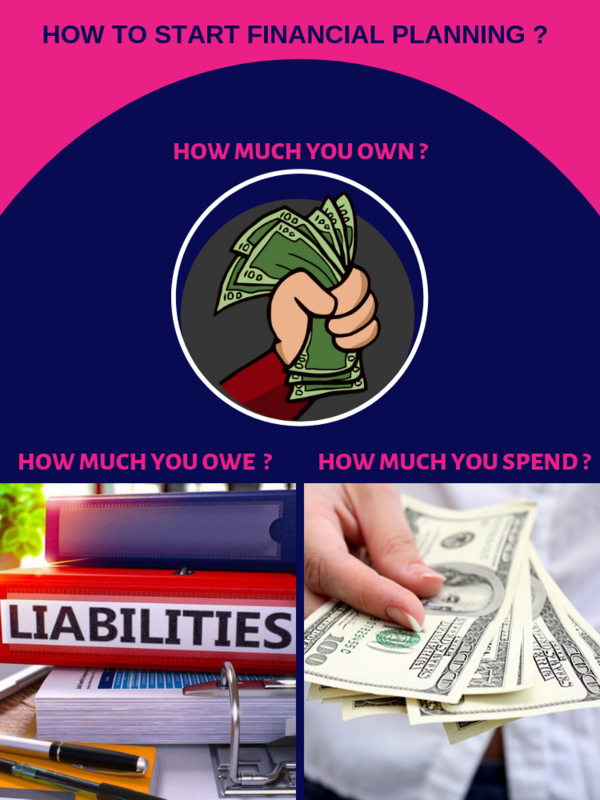 What are all the liabilities you have? List down all your loans and borrowings. Credit card outstanding, personal loan, car loan, home loan… Check if you have any unstructured liabilities. What is your family’s total income? Salary income, rental income, income from investments… Again your bank account statement and income tax return statement will be of good help in finding out your total income. Yes. Here you need to list down your family’s total expenses. Check your bank statement as well as credit card statement to get the details of your expenses. It is good to file your bills. That may help you here. Don’t miss annual expenses like tour expenses, festival expenses, car insurance, and property tax. Answering the above 4 questions is a good ground work to start your financial planning. These answers will make you realise where you are financially. If you are doing this ground work sincerely and seriously then you will start feeling that you are slowly becoming in control of your financial destiny. A good beginning makes a good end. To make a good start in your financial planning, you need to ponder over the following points and get some insights about it. You need not find exact answer for the below; just get some insight. When you approach your financial planner he will give you a better insight. This preparatory work will form basis for a healthy initial discussion with your financial planner. 1)	How many years from now, you are planning to retire? 2)	At today's costs, how much would you like to be able to spend each month when you retire? 3)	What is the inflation rate on your regular spending? 4)	At what rate you expect your expenses to go up because of changes in your life style? 5)	What is the increment rate you are expecting year on year in your job? 6)	What would you estimate as to the maximum age up to which you could live? 7)	What is the post-tax rate of return you can expect from your investments? 8)	Do you have emergency reserve? Is that sufficient? 9)	How much life insurance cover you should have? 10)	Do you think all your financial goals are Specific, Measurable, Achievable, Realistic and Time-bound? Don’t worry if you are not able to get the answers immediately. I just want you to think through these. A professional financial planner will hand hold with you in your financial journey towards your financial goals. Answers to the first four questions and some thoughts on these ten questions will help you start you financial planning with the help of a professional financial planner. You don't have to be great to start, but you have to start to be great.